We agree with Hayen et al that, similar to any retrospective analysis, our study has a number of limitations. However, to address these limitations, we examined the data in many ways, each validating our conclusions. Specifically to address the concerns of Hayen et al about measurement variability, we conducted 2 analyses. First, we compared the first elevated hemoglobin A1c (HbA1c), blood pressure (BP), and low-density lipoprotein cholesterol (LDL-C) measurements after controlled periods with encounter frequencies shorter vs longer than the median encounter frequency (2.15, 2.29, and 1.99 months for patients with hyperglycemic, hypertensive, and hyperlipidemic periods, respectively). 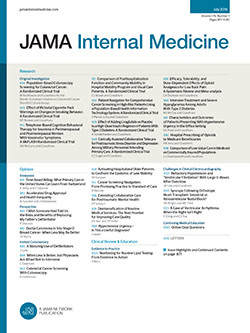 When comparing patients with controlled encounter frequencies lower than vs greater than or equal to the median, initial elevated HbA1c measures both had medians of 7.5% for hyperglycemic patients; initial systolic BP medians were both 138 mm Hg and diastolic BP medians were both 80 mm Hg for hypertensive patients; and initial LDL-C measures had a median of 120 vs 119 mg/dL (to convert to millimoles per liter, multiply by 0.0259) for hyperlipidemic patients, respectively.